How Do Porcupines Build a Home? Porcupines are the second largest rodents native to North America, larger than all but the beaver. Their geographic range spans from Canada southward into New England, New York, Pennsylvania, Michigan and Wisconsin in the East, and throughout the western United States down into Mexico. Porcupines don’t build nests, per se; they den inside rocky crevices and tree hollows. Nonetheless, their presence does alter the local habitat. Tree branches, rocky hollows, upturned logs and semi-exposed tree root systems are all suitable dens for porcupines. Porcupines favor heavily forested areas abundant with ground vegetation on which the spiny, slow-moving herbivores can feed. They prefer immature forests, where the lower branches and tree roots are less firm and more robust. Aspen, pine and hemlock forests make the most suitable habitats for porcupines. Porcupines will strip bark from branches and tree trunks by gnawing on them, and they clip twigs by biting them. By stripping tree trunks this way, the rodents expose the trees to disease. Such diseased trees, with gaping hollows in their trunks, can provide perfect homes for porcupines. Meanwhile, the stripped branches and twigs provide food for deer and other animals. Porcupines seek out crevices in rocks and trees that are large enough to provide shelter from the winter. Once they've found a den, porcupines will rarely venture far from them. Although they are solitary creatures, porcupines will group together inside one den during winter for warmth. Porcupines do not line their dens with insulation material. A porcupine den may not be obvious at a glace, particularly during summer, with overlying vegetation providing cover. Often, droppings near a den entrance provide the only clues to the den's presence. During winter, dens can be a little easier to spot, as tail sweep markings and claw prints are visible on fallen snow. Porcupines can become a nuisance in some residential and agricultural areas. They damage crops and plants by gnawing, which exposes them to disease. They even eat wooden hand tools. Dog owners must be especially wary of porcupines, as the rodents' quills can cause severe injury. Thiram, a rabbit and squirrel repellent, may prove useful in discouraging porcupines from nesting in certain areas. 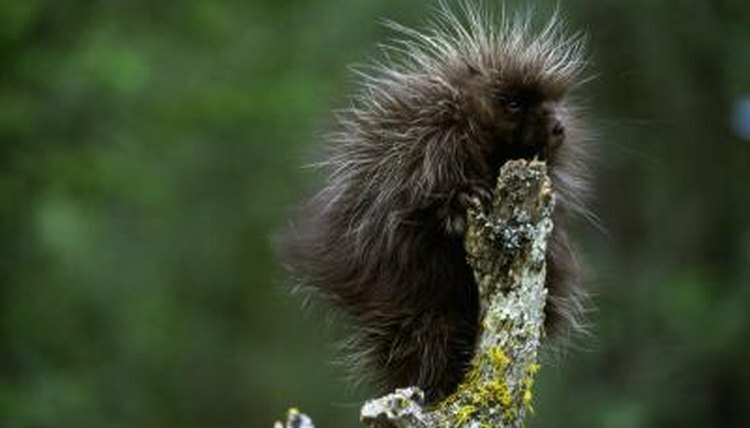 Wood preservatives won't discourage porcupines from areas but may make it hard for them to feed, forcing them to seek out other areas. It is illegal to place poison bait for porcupines. Wild Mammals of North America: Biology, Management and Conservation; George A. Feldhamer et al. Where Do Rats Go When It Gets Cold? What Kinds of Food Do Rodents Eat? What Are the Eight Types of Badgers? What Kind of Rodents Live in the Saharan Desert?